I was lying on my bed, checking Facebook when I first heard the news about Josh Duggar inappropriately touching five young women when he was a young teenager. I was heartbroken by the news in so many ways. I was heartbroken because of the victims. I was heartbroken for the Duggar family. I was heartbroken for Josh. Throughout the last week I’ve ruminated about my response to this, and as I’ve prayed for this family my thoughts have settled on one thing: I am FOR the Duggars. I’ve been FOR them for a while. Why? I am FOR God-fearing families who try to model godly living in a confused and hurting world. I am FOR young couples who choose to pray for their future spouses, marry with the goal of life-long commitment, and strive to live for God. I am FOR homeschooling and large families, for the goal of raising children to impact the world for Christ. Every time Duggar news made headlines at People.com—beating out the self-serving lifestyles of Hollywood stars—I inwardly cheer. It shows people want to hear about wholesome living, young and pure love, and babies born IN wedlock. Even after hearing news of these horrible acts, I am still FOR the Duggars. I am FOR restoration, taking what the enemy meant for evil and using it for God. I haven’t talked much about sexual abuse before, but it has impacted my life. Without going into detail, I dealt with inappropriateness during my growing-up years. There was much more emotional inappropriateness than physical, but it skewed my thoughts about myself, my body, and my sexuality. I grew up thinking women were objects, and the only way to have a real relationship with someone was to offer myself sexually. This led to be becoming sexually active at a very young age, having an abortion at age 15 and a child at age 17. More than that, I’ve seen the pain sexual abuse causes. Just last year I sat in our teen MOPS meeting room with a group of young moms. We had an open conversation about sexual abuse, and I discovered nearly every one of them had been abused sexually. I saw their tears. I witnessed their pain. I heard their heartbreak. I’ve seen how abuse has wounded them to their core. Sexual abuse is from the pit of hell, and I mourn as I realize how many young women silently suffer. I’m praying for these young women and the pain their abuse caused. I’m praying for them to find healing, and I’m praying for them to forgive. Both will happen in layers over time, but what people don’t realize is that the forgiveness isn’t just for Josh. It’s for them, too. When we forgive others it brings healing and wholeness to our souls. Josh doesn’t deserve forgiveness—none of us do. But thankfully because of Jesus we don’t have to face what we DO deserve. I’m FOR these young women turning to Christ and seeking His face through the pain of having THEIR stories sensationalized and shared without their permission. We don’t know their specific names, but while the media tries to crucify Josh, their story is being shared over and over and over again. I am FOR the Duggars to stay strong and to heal from the attacks on their family. I’m praying they will discover true friendship and a closeness to Christ through the valley. I pray for the younger children who do not completely understand. I pray their family is protected under the shadow of God’s hand. While my heart aches for these young women, my heart also aches for Josh. I made stupid, horrible choices as a young teen. I acted selfishly and sinful. I hurt others with my actions. I hurt myself. Josh Duggar sexually abused young women . . . horrible. I chose to have an abortion . . . horrible. Josh says he regrets the pain he caused. I believe him. I regret taking the life of my child. Every time our large family gathers, I think about the son or daughter who isn’t there. I think about the son-in-law or daughter-in-law I don’t have. I consider the missing grandchildren—and generations—who will never be. Young women were robbed of purity and wholeness. Josh was robbed of dignity and respect. Sin impacts everything forever. We can’t take back the actions sin causes. We can’t undo what has been done. And so I’m FOR Josh, too. I’m FOR his restoration. I’m FOR peace. I’m FOR his family. I’m FOR his heart. Most of all, I’m FOR Jesus. I’m FOR His glorification. I’m FOR the world realizing that all have sinned and fall short of the glory of God. I’m praying we will understand that without Christ, we are sinful, vile creatures. I’m praying when the dust settles the fingers will not be pointed to Josh, but to ourselves and the sin in our own hearts. I’m for the other side of the story to be told, that . . . When we need healing, Jesus is the healer. When we need forgiveness, Jesus is the one who forgives. When we need restoration, Jesus is the ONLY one who can provide it. Perhaps you’re reading this and facing pain, shame, or sin in your life. I’m for YOU, too. I’m praying you’ll turn to Jesus. I’m praying you’ll find purity and wholeness in Him. I’m praying for your family and your heart. I’m praying God will heal all your broken places—the places where you were a victim and the places where you acted out in sin. And in the end, when healing, forgiveness, and restoration are found, I pray our finger then points heavenward as we point to the One, Jesus, who creates beauty from ashes and brings joy from mourning. May the Duggars find both in the months and years to come . . . and may they know I’m FOR them and FOR all those who have been impacted by the pain and shame caused by sin. Tricia, this is so beautifully and perfectly said. 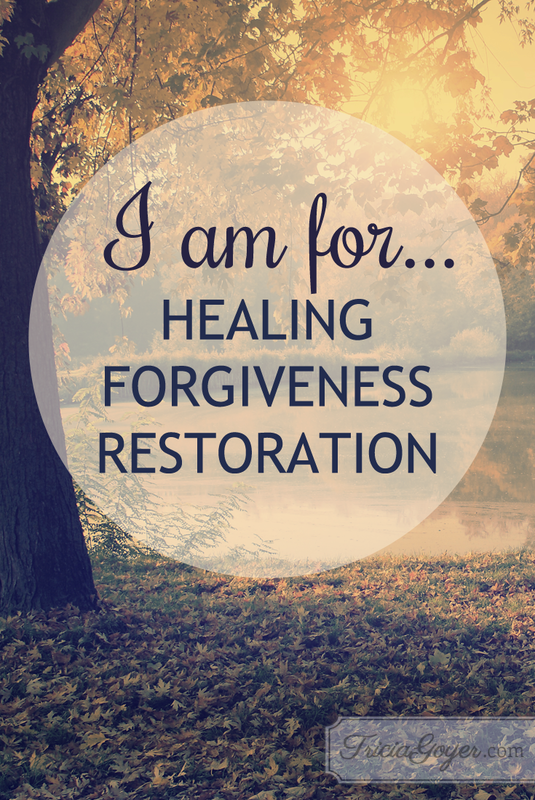 I too am FOR the Duggars.I am FOR healing, forgiveness, and restoration. You have put into words all I’ve thought this past couple of weeks as I’ve prayed for the Duggar family and the other families involved. It is tragic to me that morality says no one who claims Christ could ever be sinful. Why else would we need Jesus? We follow a loving Lord who gave his life to cover our sin, but that doesn’t mean we all haven’t sinned. Every day is a process of sin and forgiveness and healing and redemption. Christians aren’t exempt from that! They embrace it. I too was a victim of sexual abuse and ache for anyone in that situation. And I so appreciate how the Duggars dealt with that situation in a compassionate way while holding Josh accountable and getting help for everyone involved. It is such a ploy of the enemy to drag godly role models through the mud to discredit them and the name of God. Thank you for using your platform to stand for right and God and remind the world of grace, healing and restoration. May it turn hearts towards Jesus. Thank you so much, Laura!! Thank you for sharing your story, too!! Me too, Tricia! Thank you for saying what my heart has been hoping to hear. Tricia, you have written so beautifully what I have been thinking and saying since the news first broke. There’s a saying that Christians often shoot their wounded and right now when many are trying this family in the court of public opinion, they need our support and prayers. We’re not saying that what was done 12 or more years ago isn’t horrible, but that God is bigger than this. And when a person repents and asks forgiveness, He does forgive. If He forgives how can we not forgive others? I’ve been praying for the Duggars like crazy and will continue to do so. God does restore what the locusts have eaten (see Joel) and because a certain sin was committed one time, doesn’t mean it will be repeated. I, too, have wavered my stance and prayed and settled on many of the same stances as you. The ONLY thing I have left up in my mind is whether or not the family should continue (as a personal family choice) to be videoed. On the one hand, I believe that there family has been and will be an incredible platform and witness for God. On the other hand, will anyone be able to watch the show without “that lens” and if I were a victim would I want to be under it moving forward? That, I just don’t know. I continue to pray for the family and the hurt and for healing! May they make decisions listening to the gentle whisper of our Lord and not in the face of the booming wind. Thank you! In these last few days I have seen so many attacks on this family that it turns my stomach. The world doesn’t want love, peace, and forgiveness for Josh. They want to point out Josh’s sin and rub salt in his wound. They seek to stir up unforgiveness and bring pain to the wounds of those young ladies he hurt, and to plant a root of bitterness and urge its growth. They second guess the parenting decisions of Jim Bob and Michelle and want to convict them in the court of public opinion. This is all done in defiance and rejection of the message of Christ because they don’t know Him and haven’t received His loving forgiveness and cleansing. I understand why they are attacking and raising questions about why Josh wasn’t prosecuted for what he did. They seek vengeance because that is all they know. I am praying that God will strengthen this family. I’m praying that when they do the upcoming interview with Megyn Kelly that God will give them wisdom and discernment in what they say. I’m praying that through this many will see the love and forgiveness that can be theirs in Christ and will embrace it. I believe Romans 8:28-29 is very appropriate for what this family is going through right now. I pray that as difficult as this situation is for them all that they would continue to be conformed to the image of Christ through this difficult time, and that God would be glorified through it all. I have been praying for revival for our nation and that many would come to Christ. Perhaps God will use this to bring salvation to many. Exactly! The one thing I don’t find anyone addressing, however, is the role curiosity played in Josh’s sin, and in the lives of many young men who fall prey to similar temptations. Many people say he needs to get the help he needs so he doesn’t hurt his own children, but I don’t see him likely to be a repeat offender. Here’s why. As boys begin sexual development, there is a natural curiosity. We know that killed the cat, and so it did here, so to speak. This is why we shouldn’t leave any boys, even godly young men, alone with small children. With confession and repentance, it is absolutely appropriate to choose forgiveness. This doesn’t mean we don’t help the victims; of course we do for all parties to truly be able to move forward. But now that Josh is married, he has his sexual needs being filled by his wife, the natural solution God has provided for him be able to flee temptation. Thanks for your well-written support. I pray for the Duggars and for the church as a whole to also learn from this situation. Amen Tricia! We so often get caught up in the media’s interpretation of a story that we forget to look at it from the other side. The Duggars are human just like us, They make mistakes just like we do. NONE of us are perfect. If we are going to throw stones then we better look into ourselves before we pick up the first stone. Thank you for sharing a very personal part of your life to help others to understand. God bless you and your family. Tricia, this was so well said. I think it’s obvious that you wrote prayerfully. What I see in this post Jesus. He is the focus of what you write and that is wonderful and good and right. Thank you for this post! To God be the glory! I appreciate this article and your courage to speak the truth in love. Your words brought tears to my eyes. I’m from a family that is no stranger to a case not so different from the Duggars’. People can be too quick with their stones. If it wasn’t for God working in the midst of our chaos, surrounding us with those willing to live out their love and faith, I cannot imagine the state of our family. I’d never wish a similar circumstance on anyone, but through it all, God showed us how He really does make all things work for the good for those that love Him. So beautifully written!! This IS God’s heart for us all!! Healing, Forgiveness, Restoration! 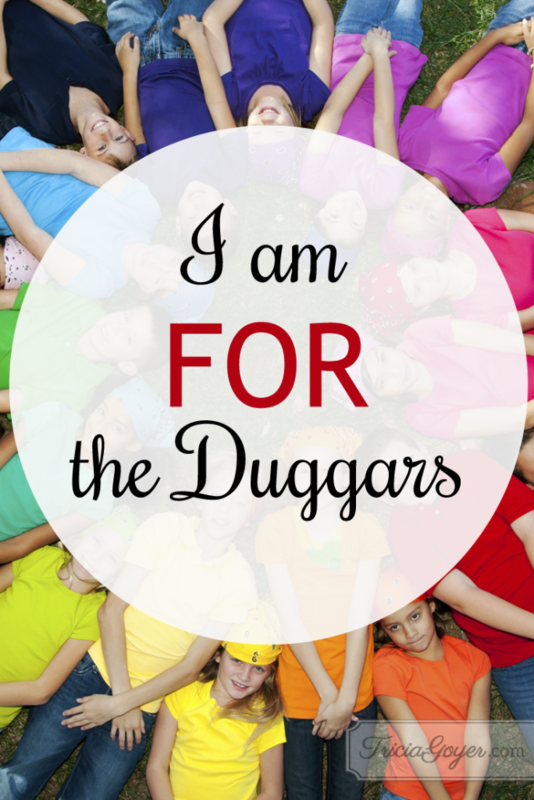 I am for the Duggars, also – healing, forgiveness and restoration. So many people find it so easy to forgive other well-known people in the media spotlight, for their sins, yet – are the first to throw stones when the offender is one who publicly professes his stand for God. Few of us have had our sins displayed so publicly, but, all have sinned and all can be healed, forgiven and restored – through faith in a loving, forgiving, healing, restorative God. Because of this, none of us has the right to throw stones at another person – for past sins – nor judge what is in his/her heart. Forgiving the sinner doesn’t have to mean we condone the sin committed. I admire the Duggar family for being bold enough to so publicly acknowledge their faith in God for so many years, and although my first reaction was surprise when the allegations against Josh Duggar surfaced – only God has the right to judge him. I’m praying for any possible still needed healing of victims and offender, God’s peace in the lives of all involved, as well as strength and His guidance for the Duggar family- in the way they continue to handle this situation, likewise for those who make the decisions re: their tv program. God can use our sins to draw others to Him, as well as ourselves. Thank you for your post and your honest transparency, Tricia!! Such a great article Tricia! But for The Grace of God go I .
I love that you are so narrow-minded that you are screening your comments and refusing to acknowledge any viewpoint other than your own. Clearly your blog post that so boldly proclaims “I support Josh Duggar” is just trashy click bait. Between that and your FB post regarding Caitlin Jenner, I am quite honestly disgusted. Lab! You are so right. This is sick and disgusting. This family knew about this incident for a long time now and still decided to be portrayed on a TV show as a Holy family, model Christian family with a horrible skeleton in their closet. So wrong on so many levels. They lied and portrayed a ruse! Is this what Real Christians do? Am I missing something here? I’m a Christian now for over 30 years. I understand all about sin, forgiveness, etc. And still think what they did was wrong! All of them! Bravo on putting into words what has been in my heart these past few weeks. My problem with the Duggars is that they publicly represented the face of Christianity. Those Christians in the public eye have a duty to be blameless. Pastors and television personalities will be called out for impropriety by the public more quickly than others. This family should not be showcased any more on television as representing truth and wholesome family values. Once the family decided to keep everything private, they lost credibility and should also have removed themselves from the public eye. Instead, they went public parading their family and falsely selling their wholesome family values brand and raking in millions while sweeping Josh’s crimes and the victims’ rights under the rug. I completely agree with you Ria. While I too am for healing, forgiveness, and restoration, there also needs to be accountability. Being in the public eye and professing to be godly you need to live up to that with no exceptions. Most importantly being a child of God and professing to be godly you need to live a godly life, be accountable and confess your sins and not cover them up. We have yet to hear a public confession and apology from the culprit. While the family does share a lot of great godly values that we as Christians should have, it seems they decided that they were an exception and that keeping this quiet would be best….best for whom I wonder. It’s interesting how all this comes out after the statue of limitations is probably up. Like I said, I too, am for healing, forgiveness, and restoration, above all I am for confessing your sins and being accountable. I love everything in this article except the repetitiveness of “I am for the Duggars.” The second caption that reads “I am for healing, forgiveness, and restoration” should be the title. Well said, spanishcook. Christians need to lead exemplorary lives, especially in this time when we are being held more accountable than ever before. Yes! I’ve never commented on your blog before, but I had to say Thank You for using your platform to speak out for this family. So many families hurt and have issues and need hope. I pray those families who live in fear and hopelessness will see this family and know that God has a plan for them. We live in NW Arkansas, home of the Duggars. We have glimpsed them at Goodwill; we’ve met a family member by coincidence; we are friends with their mutual friends. And my daughter LOVES their show … she has read the girls’ book on relationships. My biggest question was HOW DO I TALK TO HER ABOUT THIS??? How do I tell her 1. we aren’t the judge 2. horrible things happen even in sheltered, protected places like home & church and 3. there is grace, forgiveness … and yes, consequences too. BUT God is handling it. This article will definitely help me continue to have this conversation w/ my daughter. Thanks for sharing! Thank you, that was beautifully written. So beautifully said. Thank you for sharing. Thank you so much for posting this! I too feel the same way, My heart aches for the Duggars and I have had them in my prayers. Some of the things being said about them are so horrible. I live in Arkansas and have a friend that went to school with MIchelle, he said she truly is the sweet, kindhearted Christian women that you see on the show. It breaks my heart for them to be under attack the way that they are. It also breaks my heart for people to be so quick to judge and point out when Christians sin, as if we are perfect. Thank you for the post. God Bless! Beautiful Tricia! The Lord wants to heal, forgive, redeem! What can separate us from His love? Blessings- thank you for the courage to post this! This is beautiful. Thank you for sharing. I’ve been reading so many disgusting comments about them. It hurts my heart. So beautifully written. I am praying for this family and the girls that were victims. God forgave Josh and so should every one else. God can heal all those involved suffering from this and can make something so beautiful out of it. I respect this family and pray God’s blessing on them. By this argument, no one should ever hold a public platform as a Christian except Jesus. But some are called to. And our enemy would love nothing more than for more to shy away from that call. The mistake the Duggars are paying for is their lack of transparency. Now we all would be making an equally bad mistake by not showing them the grace Christ showed us. No one is talking about the official who released records that were supposed to be sealed forever. What parent on earth would have brought this to light thinking that it was behind them? I dare say not one. We are all called to forgive as God does. He forgives our sin and casts it away as far as the east is from the west. Lastly, to those who still wish to burn the Duggars at the stake I would say be careful if you think you stand for you just might be sinking.